I hate to admit it, but my quest for financial independence did not start from a vision of a beautiful blue sky future, my quest for financial independence was born out of fear. When I entered the workforce in 2005, Michigan was in a single state recession, and was hit harder than most other states during the nationwide recession a few years later. I was 18, living in an apartment with my girlfriend and her child and we struggled to pay our monthly bills. Fast forward 4 years into the future and although we owned our own home and had some cash in the bank, we still didn’t have a lot of capital, and I had the genius idea to spend virtually all of our cash on buying a house at the tax auction to eventually flip. That did not work well and I ended up unemployed, with no cash in the bank, a house that was in a horrible state of disrepair, oh and a new baby. That boneheaded move caused me a lot of fear and anxiety. 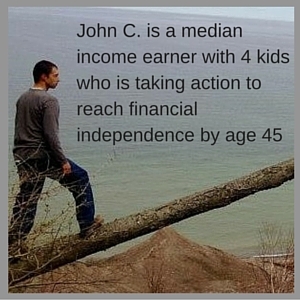 Since then Mrs. C and I have worked diligently to build up our capital to cushion us from job losses, recessions, and stupid tax, and this fear and anxiety is what led us to seek early Financial Independence. If you aren’t concerned about recessions, or getting laid off, or just making bone headed decisions in general, then perhaps knowing that a massive shift in the economy and the state of our species is going to happen, and soon, may motivate you to take action towards financial independence. AI Will Take Over The World. Since 1965 computing power, more specifically the number of transistors that can fit on a chip has doubled every 2 years. Think about this for a minute. This means that once computers reach human intelligence level, in a decade they will be 32 times as smart as us, and in another decade they will be over 1,000 times smarter than us. So when do we think AI will reach human intelligence? Google’s director of Engineering Ray Kurzweil believes this will happen in 2029. That’s only 12 years from now, and AI can already do many specific tasks better than humans. There are self driving vehicles on the road right now, it won’t take 12 years for driver jobs to start disappearing. The World Economic Forum predicts 5 million jobs losses by 2020 and a study by PriceWaterhouseCoopers shows 38% of total U.S. jobs gone by the mid 2030s. To sum this up, in the time frame of 1 workers lifetime career, AI will go from being about as smart as a mouse (today) to being 1,000 times smarter than humans. The changes this will wield on our world are unfathomable, but one thing is certain, along the way we will need to adapt, and if we don’t we will be left behind. If you thought the outsourcing of manufacturing jobs to China in the late 20th century was bad, the coming AI unemployment wave will be much worse. I get that some people have no desire to retire early, and thus think that accumulating capital is a waste of resources that could better be spent in the present. If you are one of those people, think about what would happen if you didn’t have the option to continue to work. Our primary goal NEEDS to be accumulation of capital. When the AI revolution hits, and it will be frightfully soon, you don’t want to be without capital. Not only should we as individual workers be focused on this, our children need to be focused on this as well. My boys range in age from 14 to 4. My four year old will turn 18 in 2031, by then AI will have already taken over huge segments of our economy. It will be more important for this generation to accumulate capital (and quickly) than any other in human history. We are on the verge of obsolescence. We, and our children need to be investing in stocks, buying real estate, and building a cash cushion right now. How does accumulating capital protect you against the AI revolution? Most likely there will be widespread job losses. People will be unemployed indefinitely. Having a paid off house, or two, and a sizable nest egg can lessen the blows of this shift. Society may be able to fix these problems, but it will take time. Do you want your future survival to depend on the action of congress? Some jobs will be much easier for AI to take over than others. Repetitive physical jobs will be the first to go, and many of those have already gone through the automation revolution in the 1980s and 1990s. Perhaps the most glaring example is driving. Virtually all jobs that require driving will disappear, and much sooner the what the masses believe. Self driving technology isn’t on the way, it is already here. Within the next decade trucking, cabs, delivery services, will be replaced by AI. Starting a career, or having your children start a career in trucking would not be ideal right now. Another opportunity is to work for corporations that are slow to implement change. There will be self driving cars, and retail stores that employ zero people, but it will take a long time for all of them to convert. When I worked at KFC in 2007 we didn’t accept credit cards, you know those things that every single person in the US has used to pay for stuff for a couple decades. A local grocery store around me to this day has zero self scan lanes, and employs baggers. This isn’t an end-all solution. A lot will happen in the blink of an eye it takes AI to go from being as smart as a human to 1,000 times smarter. Adapting to new skill sets might delay obsolescence by 5 to 10 years. Constant adaptability and learning new skills will be needed. I personally believe in the long run reaching AI will be one of, if not the most important invention of mankind…(although it has the potential to kill us all). AI will allow us to cure diseases faster, edit genomes, potentially end aging, travel to other worlds, end hunger, and do all sorts of other cool things. The truth is we can’t prepare for AI and it will happen, and it will most likely happen this century. We can’t fathom what changes will come about when AI is substantially smarter than all humans on Earth. What we can do is prepare for the interim. We know that there will be transitions in the marketplace. We know that certain jobs will disappear. Sticking our heads in the sand and planning to work until we die is not an option. What are you doing to prepare for AI? Have you even thought about it? Do you think these fears are overblown? One Response to "How To Prepare For The AI Revolution"
Fact check: Ray Kurzweil is way more important than a director of blah blah at Google. I am lucky enough to have met him in person. He has paved the road for keyboardists and musicians with disabilities. He also believes in the singularity — he is beyond AI, and more FR — Future Reality. I want to be clear, he is a good person who is very smart and who is thinking 100000000 steps past us. I am fact checking because it would be pretty easy for me or Todd to become a director of blah blah blah at Google within a few years — Ray Kurzweil has changed the world and perceptions with his point of view, and he gives back. He is the kind of person who I admire. 1) I don’t think AI will replace our purpose, but I hope it replaces some jobs and gives other ways for people to spend time. 2) I don’t think that capital will help. I think education and confidence in their own abilities will help. 3) I think AI has potential to help us not with just Ray’s vision, but also with how to make better choices with our time on earth. Most AI I’ve used has been mediocre, but if I never had to schedule a meeting, if I never had to shovel snow or take out the garbage — these things add up and become ways we can make our life more meaningful.